Dress Like a 100-Year-Old Day first bleeped onto my radar a few years ago, when someone submitted a picture to my Yo, Is This Ageist? blog. 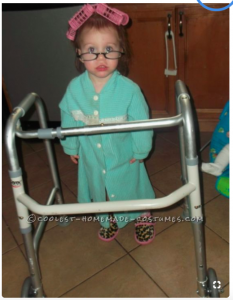 It showed a little kid hunched over a toy walker and sporting a gray wig and fake glasses. All this regalia, along with fake wrinkles and drab duds and fake canes, is available in party and costume shops as the 100th day of school approaches. 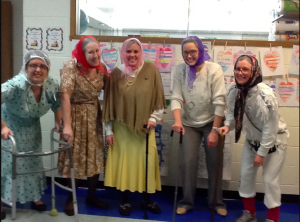 Once an opportunity to teach elementary-school kids about the number 100, the day has devolved into a bizarre dress-up ritual that equates old age with disability and little more. The timing matters too. Much research shows that attitudes toward aging, like attitudes towards race and gender, start to form during these impressionable early years. Just as schools celebrate the achievements of African Americans during Black History Month and of women on National Women’s Day, how about turning the 100th day of school into an event that “inoculates [children] against ageism,” as Jill Vitale-Aussen of the Eden Alternative suggests in this scathing blog post? Dress Like a 100-Year-Old Day: A Call to Action, a new campaign spearheaded by the Eden Alternative, Pioneer Network, and Leading Age—three organizations at the forefront of culture change around aging—aims to do exactly that. Use the campaign’s great graphic any way you like. Download their Call to Action Letter_to_Educators, discuss it with teachers and parents and school officials, ask senior centers and retirement homes to make this a powerful opportunity to engage with local schools—and insist on change. Or as a less restrained commenter put it, “Let’s turn this obscenity into an opportunity . . . yell, scream, protest if your child’s school is participating in one of these events!” Movements need direct actions, and this one has fantastic potential for a movement against ageism. In addition to the Call to Action Letter_to Educators, here are some other resources to share with teachers. You’ll find them, and lots of other stuff, on Old School, our newly-launched clearinghouse of anti-ageism resources. Old School is now in session! Everyone please lets start reporting to this organization to fight for our rights with this put down. Doctors are saying they do not want to do anything for health or quality of life for elders because there is no reason. I have personally had a Physician tell me this statement. WE need HELP with a mentality such as this thinking. And lets stop senior citizens bullying. It’s so important to point out these kinds of put-downs. They are common, and they aren’t usually done with malicious intent, so people need to be educated.